I met Austin Brawner and Chad Vanags at the Ecommerce Fuel conference and I was really impressed with their ecommerce knowledge. They have a lot of hands on experience with running email campaigns for medium to large shops and they are very open about sharing their knowledge. Austin and Chad also run an ecommerce blog at EcommerceInfluence.com and right now they are offering a free email autoresponder bootcamp which I highly recommend that you check out. 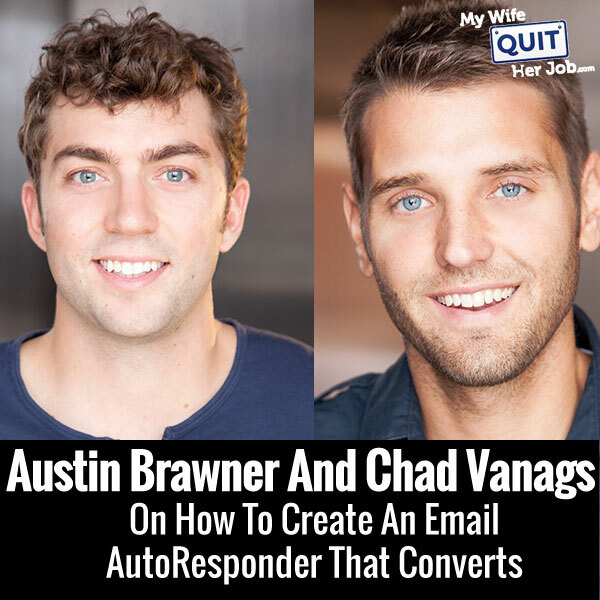 Click here to check out Austin and Chad’s free email autoresponder bootcamp. Steve: Welcome to the My Wife Quit Her Job Podcast, today I’ve got two people with me on the show, Austin Brander and Chad Benix. Now I met both of these guys at the ecommerce fuel live conference in Austin Texas last year and they actually both really made an impression on me. So what they do is they create behavior based triggered email marketing campaigns for ecommerce, and if you don’t know what that means we are going to get into that today in great depth. Now besides being cool guys, they both run ecommerceinfluence.com where they help other ecommerce stores improve their sales, they also run an awesome podcast that you should all check out called Ecommerce Influence as well, and I’ve actually had the pleasure of being a guest in the past on that show and it’s definitely one that you should check out. Now what’s fun about Austin and Chad is that they’ve helped so many different ecommerce companies in so many different ways, but today what we are going to do is we are going to focus kind of on the market personalization aspect of helping business and basically they had to tell the shopping experience via email differently based on the individual and what’s sort of actions they actually take on your website. And with that intro welcome to show Austin and Chad. How are you doing guys? Austin: Hey great Steve, thanks for having us and we are pumped. Chad: Yes super stoked to be here. Austin: It’s been a little while since we hang out in Texas. Steve: It has and I imagine we will see each other again this year at the conference again, you guys will be there? Chad: Yeah, and more barbecue too. Austin: Awesome men, so you know first off I’ve never interviewed two guys simultaneously before, so I want you guys to take a little easy on this poor Chinese guy here. Austin: It’s all right we are one mind here, so it’s all good. Steve: So before we start up I’m pretty sure a lot of the people listening don’t know who you guys are, so give us a quick background story and how you guys got together to start Ecommerce Influence. Austin: Okay, perfect well, Chad and I actually worked together at a previous company for– what was it about? Two years, yeah, two years together and we split off, left the company separately, went kind of different ways, we’ve had a similar vision about transferring some of the stuff we learnt at the last company to where our real focus was which is ecommerce. Steve: Was that last company an ecommerce company, sorry. Chad: But they were really good at online marketing, they were huge. Austin: It was incredible, it wasn’t– it was business to business and also like business to consumer, but mostly business to business, they were excellent at the domain marketing. Chad: That’s kind of where we got our taste you know and it’s weird because we got the taste there then we left, kind of went off and did our own thing, and Austin was just crushing it with these ecommerce companies. He came back to me and he goes, hey you are doing your own– actually the weirdest part is we would meet every Friday for like a year to talk about marketing and we were still hustling by ourselves like really speeding wheels sometimes like you know launch forward then you had to back up and launch forward. And then one day Austin was just like hey dude, why don’t we just team up, and I was like oh man, that’s so smart. Steve: What if that person happens to be a wife or a girl friend, you guys still recommend that or? Chad: No, I think we talked about this before, it’s really top anyway I was like ahh, we are going to meet, yeah, hold on. Austin: Yeah, that’s how we found each other to talk about that stuff, but yeah so we were meeting up, and we’d really focused on it, the last company we worked out was inbound like email marking. So capturing people who come to the website and then build a company was almost ten million dollars, almost 100% through email marketing. Everything was sold through email marketing, that and the combination of being on the phone, but there was really sophisticated sequences that we build for those B to B companies. We realized that there just are not out there, like ecommerce companies are not doing the same stuff and putting as much time into creating sophisticated, really powerful follow up sequences that business to business companies are. Steve: You know it’s funny, I just interviewed Ezra Firestone, we were just talking about the same thing. A lot of the info product guys are doing a really great job at this, but the guys selling physical products typically don’t think in terms of funnels for some reason. Austin: No, it’s true, it’s really– I think it has to do with maybe people thinking that they have so many different products that it’s not going to work, where info product guys have like one or two, but it really does work and it’s where we saw a huge opportunity. Chad: Yeah, the other thing is like, what I’m actually astonished by is that not enough– like you said physical products or whatever maybe, most people aren’t using email marketing in any way except for the online marketer for the most part. I just met with a guy today who actually creates documentaries and he’s a friend of mine, he is making a feature film and I’m asking him like what, how are you marketing this, and it’s only like through twitter and facebook, I mean do you capture any emails at all? Do you use email marketing in any way to get your feature film out there, and he’s like no, I was like wow, we could really take this to the next level with email marketing so. Steve: Yeah, especially for him it sounds like he could create a following really easily right. Steve: Yeah, easily. All right, let’s talk about some of your biggest wins; I want to hear about those before we get into the guts of the section here. Steve: So what’s some of the companies and what’s have been the boost in sales once you started using email marketing with these companies. Austin: Well, I think it’s important to distinguish a little bit between like the different types of email marketing, so it is some bench marks that are run every quarter by a company called Absolunave; they profile how much email is sent and what percentage is sent to each different type of email. So there is usually two types people which people are listening are probably familiar with. Number one is that like newsletter type email great, which a lot of companies actually do send out, a lot of ecommerce companies they send out either promotions, product launches, just a typical kind of business is usually know. That accounts for 96% of all email sent, the other type of emails are the triggered emails. Triggered emails are based off of an event or an action that somebody actually does on your site, so and it’s– you can either, you can reward people for good actions, right. Somebody signs up for a newsletter or your ecommerce site well then, that’s a good action and you would like to reward them with something whether a follow up email or a coupon, that sort of thing, or like bad actions as well they can be followed up with where somebody abandons a cart. It’s considered a bad action, but that can link to an abandoned cart email that follows up with them to try to bring them back into a customer. And so those are only about 3.9% of all emails sent, but they are way- way-way more effective. I’m talking about– go ahead. Steve: So when you guys go in and help a company does one replace the other, or do you still do both, like the newsletter style plus the triggered emails? Austin: So absolutely working together, that’s where a lot of companies have a focus on the newsletter, but haven’t dug to triggered emails, and that’s where a lot of the money can be made, a lot of it actually comes from triggered emails. Those are the typically the money making emails are the ones that are triggered where the newsletter are the more a broadcasting content. Steve: Okay, so here is a kind of a broad based question here, let’s say you are using the triggered email as a broadcast, now presumably that email won’t apply to everybody, but it will apply to a certain subset of people. So what are the disadvantages of sending out broadcast versus more targeted emails? Austin: So the disadvantages of sending broadcast versus more targeted, well I think what happens is if people want to protect their brand right, and they want to provide– so you will see this in a lot of ecommerce with stores and other brands, they don’t want to give away discounts or coupons because if they feel like they are getting out, this may devalue the brand, right? Steve: Okay, right, right, okay. Austin: But still those are very-very valuable especially to people who have been with you for a long time. A customer who’s purchased let’s say, $300 worth of your products like six or seven time is way more valuable than somebody who has purchased one time. So you may want to reward the people who are previous customers and specifically like VIP previous customers with trigger emails. So let’s say when someone passes a certain threshold maybe they hit $500,000 in sales, then they would receive some sort of a reward based action and you are not blasting your entire list. Likewise with somebody, you know customer acquisition is difficult, it’s something where it’s expensive to go use adwords, Facebook and often time you are very close, you can drive somebody to the website and they can be looking around, and they can be thinking about purchase and then they bounce instead of purchasing. So that’s kind of wasted money where you would rather capture those people with some sort of an offer, and then follow up specifically one to one with a potential new customer, to get them to convert and finally like and turn into a customer. And actually capitalize on the spend you’re doing, you’re putting out there for customer acquisition through AdWords or Facebook. Steve: Okay and so does this work kind of in conjunction with retargeting ads as well? Austin: Absolutely, it works in conjunction with retargeting ads. There’s also ways to set it up so that you can even determine if people click emails or open emails, it can disable or enable certain retargeting ads based on their behavior. Steve: Okay all right, so let’s kind of like start from the very beginning. Steve: Pretend like I’m a company who doesn’t do any email whatsoever, I come to you guys, what are some of the questions that you ask me? And where do you kind of get started with this whole thing and setting it up? Chad: Well yeah, this is Chad by the way. Normally when somebody comes in through the door here, they come to me and I start with a series of questions. First I want to find out about their business, and find out actually what they’re doing now to get to where they want to go. So we start off figuring out, all right where are you at now? Where do you want to go? What are you doing? And how is that working, right? Just kind of start this the whole thing off. Then the following question is really these simple– honestly I call these disqualifying questions, this is when I know if they’re serious or not, when I say serious I mean have their stuff together. Either they are a perfect client for us or not, but it’s what is your cart abandonment rate? So most people don’t even know that, but on the flip side what is your cart recovery rate, right? Meaning how much revenue are you recovering currently, so if you’re losing let’s just says there’s $100,000 lost in abandoning carts in a month, you want to get 10% of that, which is 10 grand. So I say what is your abandoning cart rate and most people don’t know. On top of that the other question is, what are you doing any way to recover? So we’re looking for our super number one question of recovery rate, but what are you actually doing? And a lot of people have something like abandon aid in place, or these one systemized emails through a plug-in in some capacity. And that tells me right away that they’re trying obviously not succeeding, because they usually don’t know the recovery rate. So there’s an opportunity for us right then and there to actually make a difference. After that we really jump into a few other things which we might talk about later in this podcast, but one of them is list building, right. How are they building their list? What’s their conversion rate on their website in terms of the email list, and what kind of welcome sequence do you have post purchase sequence, and what kind of results are you getting from that. Obviously there’s whole suit [ph] of questions that I go through, but I think especially when we’re talking about abandoning carts, that’s really the first couple of questions. What’s your abandonment rate? What’s your recovery rate? And what are doing about it right now? Steve: Okay so let’s talk about the abandon cart email sequence first. Now presumably if they’re not doing any email marketing, they’re probably not doing any abandoned cart stuff as well, so what does a typical abandon email sequence look like for you guys, like when you’re employing one? Austin: Sure, well I think just to be clear if people are– yeah, if people aren’t doing email marketing they’re probably not doing abandon carts, but a lot of people are doing email marketing and still aren’t doing abandon carts. That’s also one thing that first question is what percentage of your emails are newsletters versus behavior base are triggered? And so going to abandon carts and what those actually look like, so and this kind of goes in to some of the wins that that you were asking about earlier, the type of stuff that we’ve been able to put together. We focus on a much larger like kind of processor system than a lot of other people, it’s not just someone abandons a cart; let’s hit him with the email to trigger them to recover. There’s a couple of things you got to think about right, because different steps since– if someone adds something to the cart they’re surely interested right, if they leave that in their cart and don’t return for let’s says seven days, well they probably forgot about it. But that’s a lot different than somebody who’s left it in their cart for one or two hours. Often sometimes something comes up; people may have to leave to go pick their kids up and couldn’t finish the order. So the way we approach it is we look at it as time based. So within the first day, we usually follow up with an email that focuses– it’s recovering– it’s trying to get the people who just got in and thrown off when they were checking out, or had trouble with check out, right. So it’s not sending an offer or anything like that, it’s just checking in with them, providing customer service, customer support, and giving them a direct line to the person who can help them check out. Austin: After one day then psychology kind of changes, because if they ignore that first email and don’t check out, that means probably they’re not as interested or maybe they’re thinking about somebody else, maybe they’re price checking that sort of thing. So then we follow up with emails that are more offer based with urgency, to try to get them to convert, a couple of emails, two to three days away, and a lot of this comes down to personal testing. I can’t give a template for what’s going to work best for your business, because everyone is got a different kind of buying cycle. But usually two to three days later send an offer to them, and then a week later just checking in trying to like close the deal. And after a week you run to a period where you don’t want to lose these people, but it’s been a week since they added it to the cart and haven’t checked out, so you got a much higher chance of losing them, if that makes sense. Steve: So when do you guys give up, by kind of like the week has passed? Austin: Kind of like– well we really think about it’s like buy or die at a week, you give them your best offer at a week and then afterwards if they don’t convert you can follow up later on, but typically the process is about a week long, week to 10 days long. Steve: Okay and then do you try to get them to opt in to an email list or anything at that point, or you’re just trying to close the sale? Austin: That’s a good question, actually you don’t even need to get them– you don’t even need to get them to opt into an email list to send them emails, like these abandon cart emails because they’re transactional, you can send them directly to them. The whole point is just one point is just to get them to make that purchase, become a customer. There’s only one really thought process, that’s close the deal, they were so-so close; you want to get them to make that– to check out. Steve: So does this process always include some sort of coupon code or discount? Austin: Not always, but it’s way more effective if it does. Steve: Okay, so that’s the abandon cart sequence. Let’s talk a little bit more about the post sales process; presumably you guys have some sort of sequence that you put in place also once a customer has made a purchase? Austin: Yeah absolutely, and that’s going to depend once again on every brand, but I’ll give some kind basic rules of thumb and also talk a little bit about how like what we’ve being seeing. So after someone makes a purchase, this is a place where I think most companies just are totally negligent. They do not think about the ideal experience, and follow up that needs to happen after someone becomes a customer for the first time. This is really like the door opens, because a lot of times people continue to purchases more one after another and become big fans. So we start outlining desired actions right, what is the best possible thing that can happen to somebody after they make a purchase? Typically it comes down to you want them to write a review for the product they just purchased. You want them to– if there’s social media channels follow on social media channels. You want them to share with their friends, those are three desired actions. And then ultimately the other desired action is to get them to make another purchase of a similar product, or a complementary product. So we outline those desired actions and start building sequences based over 90 days that target people, 90 days is a typical range, but depending on your product it maybe longer or shorter. Replenishables often it’s quicker like socks or something, someone might want to buy them within 30 days or 60 days. Steve: So what frequency do you send these emails out at? Austin: That’s really depends on the type of product. I would give a general overview of like maybe six to eight emails over 90 days, like that is what we want to put together. Because remember you’re going to be supplementing these with newsletters emails. So these are specific action based, triggered emails, I mean they’ve hit 60 days after making a purchase and haven’t purchased again, it goes out. But you’re also going to be hitting them with whatever newsletter emails you’re doing on the other side. Steve: Okay, so newsletters emails, meaning the traditional stuff like we’re having a sale here this is what’s new in the shop and that sort of thing? Steve: Whereas these other emails that you’re talking about are more along the lines of where you kind of tell your own story and have people share their experiences with your company? Austin: It’s a combination of like direct offers, especially with complementary products right. Because if you know someone has purchased let’s say a good example– okay so here’s a good example, let’s say someone purchases a straight razor from a [web] [00:20:34] shaving company. Austin: And you know by looking at their customer reference they’ve never purchased the strap whatever the sharpener, so then you’d follow up with a complementary product, to try to get them to add on to what they have already purchased. That can go on and on whether it’s they’ve bought boots and they want to follow up with either a complementary pair like or style, or something to clean them that sort of thing, there’s lots of different options and there’s a specific targeted of emails. Steve: Okay and so that implies that your emails are being sent out based on some sort of customer database that you have? Steve: Is that– okay, so let’s talk about that, because that’s kind of the most interesting part of all this right? Austin: Before we move on I want to say one thing about each, about the abandon carts, and the post check out sequence is– so typically right– actually you need some like aggregate email. Clavier there’s somebody Clavier that we’re going talk about in a second, does a great a job of providing that customer database. They averaged up all their emails and measured the number of emails sent divided by revenue created by those emails, and they found that on average every email that their customer sent brought in 20 cents. Some of these emails– sequences we’re putting together are hitting like five and $10 an email, because instead of being a broadcast to everybody, they’re just targeting one to one, and specific places, during specific actions, and they’re recovering carts or they’re getting people to buy complimentary products, and they’re really-really effective. If you’re already running newsletter emails, getting these targeted emails is going to boost up the amount of revenue you’re bringing in without sending a ton more emails. Steve: So without actually giving away your clients’ names, can you actually work through an example of one of your implementations? Austin: So let’s start with– I guess I start with abandoned carts, that would be a good one. We put together abandoned cart sequence before the holidays for one of our clients and they were looking– they had like a really busy holiday season, it’s like they’re holiday focused. Austin: So we put together an abandoned cart. Steve: I think I know what company this is already but go on, yeah. Austin: So we put together a holiday focused abandonment cart sequence and we targeted the difference between– well they had some rules, right. Because most of their products, the products they wanted people to purchase were above, I think it was like $65. Below that were the smaller products that actually ate into their margin a little bit because of their shipping offerings. So they weren’t that excited about selling the smaller products, but they were very excited to sell products above the $65 mark. Austin: So we created actually two campaigns. The campaign for the above $65 mark included discounts, and was really aggressive to try target these people, because they knew if they converted they were making a lot of money off every purchase. Austin: So it was a four email sequence, customer service then there was a very like an offer. I think it was 15% off under a 48 hour deadline. Two emails for that. And then a follow up email from like a higher up person who was trying to get them to convert. And then we had also had the second sequence which was for lower than $65, which did not include a discount because it was not worth giving a discount to people who were lower than $65. That same thing can be done with international versus domestic orders, because often times people can give free shipping domestically, but not internationally. So there’s really good offers you can do when you segment. Steve: So this is just based on what people actually put in their shopping cart? Is that correct? Austin: Based on what they put in their shopping cart, and you can actually even segment them based on IP address. Austin: That one brought in over a 100 $10,000 in a month and a half of closed out carts, just putting those two things together. Steve: I’m just curios how that would have compared to just kind of a generic abandonment sequence, where everyone got the same sequence like, “Hey, I know that you didn’t finish check out, why don’t you come back.” Versus– and then sending another email a couple of days later with a coupon code, that sort of thing. Do you have any sort of insight on that? Austin: So you’re saying it’d just been a single email or two emails? Steve: A series of two to three emails versus this sort of targeted approach, where you’re sending out coupons just to people in a certain segment. You kind of see what I’m asking? Austin: Yeah, yeah. Well, the reason we don’t have the opposite is because they didn’t, as a company they didn’t want to send those coupons to those people who were lower. Austin: It made sense for them because just purely because of their product offering. We had to go, we had to segment. They wouldn’t want to do it if it wasn’t segmented, if they had to treat everyone the same. Steve: Yeah. It makes sense, because if they gave coupon codes for the cheaper items, then they might have lost money on that, right? Steve: The segmented approach, yeah. Chad: Is just blasting out to whoever and whatever they buy. Do we know the differences like any numbers on them? Steve: What happens during that last email; is that like the best offer of them all though, in that last email? Austin: It depends. Often it really depends on the company. So yeah, we like to put a better offer in the last email. But sometime it’s matched the same. If we ever look at the lowest possible offer, it will be the same as offer three or offer two. But it will be just delivered in a different format. So instead of just an image with your stuff like a personalized email describing that you want to have them join the company– become a customer and that you’re personally putting together a coupon code for them, that’s sort of thing works well for them as well. Steve: So are we kind of training customers to kind of wait for these coupons though? It’s becoming a pretty prevalent practice these days with these abandonment sequence, right? Austin: Well, I wish it was more prevalent, but no people are– yes and no. It’s becoming more understood, but it’s not out there as much as it should be. And here is— it’s a really good question, because what you want to do is you want to make sure there’s a lot of options, that you’re a service not just a one off coupon deliver. You can divide it between first time customers; deliver something different for someone who’s been a customer for a long with no offer. That’s often another one we’ll do. We Segment out first time customers, and previous customer and give previous customers no offer. And first time customers be very aggressive because we know we want to acquire a customer for the first time. Austin: So that goes back to– that’s all like segmentation. Austin: And so many advantages of segmenting between first time, previous customers, or even people, previous customers who’ve received an abandoning cart email one time in the past, you don’t want to give it to them again. So you don’t train them. Steve: Do you guys do anything in terms of helping kind of like more of a cold customer? So let’s say a customer has landed on one of my content pages. And I actually got them to opt in to my list. Do you guys do any sort of segmentation on those kind of cold people coming in? How do you convince those guys to buy? Austin: Going to back to what we talked about with post check out. Austin: And the desired actions. For welcome sequence we like to think of best possible things that they can be exposed to, to give them the highest chance of making a purchase. So once they sign up and often times we’ll help companies build a higher more compelling offer for them to sing up with. And sometimes that can be– whether it’s a coupon or some sort of a download, a buyer’s guide, those sort of things. We’ll typically deliver that and then focus on building a sequence that ultimately the number one goal is to get someone to convert from a subscriber into a buyer. Austin: But at the same time you don’t want to just hammer people with discounts. You want to tell the message of your store, you want to have them complete other desired actions like follow you on Instagram or Facebook, tied with the offers, specifically with urgency. Because we talk about training people, it’s important to give them– if you’re going to give a discount make sure that it just lasts for like a day or two days. I don’t like giving open ended discounts, because if you train them when they get an email, they’re going to make a purchase within 24 hours, that’s something that consistently goes with them throughout their life cycle. If you’re just giving discounts, discounts, discounts, it kind of just devalues what you’re doing. So the whole goal would be to convert that subscriber into a buyer. And then once they become a buyer you change your relationship with them, where you’re not giving them any discounts because they’ve already made a purchase. Steve: In order to get them on our list. So what would be kind of your sequence, your first couple of email sequences, and how would you get them to actually buy some of these things? Austin: Well, the question would be what would be the– is there an introductory purchase or what is the most typical first purchase from customers? Steve: I guess it depends who they are, but a lot of our customers let’s say are just brides. Steve: Brides to be who want to buy some of these items as a part of either a gift for the bridal party or as part of their wedding. Austin: Okay. So obviously delivering the arts and crafts guide. Then thinking about well if the goal is to get them to go from arts and crafts guide to making a purchase, what differentiates you guys from everybody else? So for a lot of the brands that we work with, a lot of it is going to be telling the story if there is social aspects, exposing the people who get subscribed but haven’t seen like the important pages on your website, and then combining that with an increasing offer. So one email maybe a week later with an offer for them to get onboard and make their purchase. If they don’t respond to that one, then maybe following up with something that’s not an offer a week later or 10 days later, then try again 10 days with a better offer thinking, “Okay what is the”– knowing what your allowable cost is to get somebody to convert, and then increasing it from where you want to be to your allowable cost, because you still– no matter what you want to get these people to convert. And once they convert and they make a purchase then kicked out of that sequence and they go to a new one which is not incentive heavy. Steve: Are there any incentives other than discounts that you guys employ with your campaigns? Austin: Yeah, there are. Discount is just one– it’s easy to talk about because it’s in eCommerce. What other incentives we’ve got– it really depends on the– what else do you offer besides discounts? We can relate to your store. Steve: Sure. We tend to offer kind of information. Austin: Okay. I see what you are saying. One thing we’ve been building a lot of that have been really, really helpful is like buyers guides. For example we just build one for one of our clients. He’s in the wet shaving niche. We went over and we built out a downloadable guide that explains the best materials, or the best type of products for the beginner being like intermediate and then the expert. And those are increasing based off of their reviews, like in-house, what people like, that sort of thing, and then each one has got a description and link back, so they can purchase it on the site. And it’s been shared– people have been going crazy about these buyers guide because it answers the question they’ve already been asking, and does it in a way that they can just have in their computer and then go check out and they can forward to their friends. That’s one of the things we’ve been employing that works quite well. Chad: I think there is a lot of things that I think somebody can do for this welcome sequence, like honestly a lot of is information, we’ve talked to a lot of eCommerce companies that have been using video. I think of Alex Icon from [Lexi Hair for One]. Think about the number question that he probably gets for– and this is hair extensions by the way. The questions that he gets from potential clients are about hair extensions, and he’s got a ton of videos. I think he’s got like a million subscribers and if somebody opts in to his website you can send videos over, “Hey, by the way here is how you do this,” and then another video on how to do this. “By the way would you like to buy something that helps you do this better?” I really think that content side is really a big part of it. Austin: Yeah, well it is. And I think just to be clear from what you were saying earlier when I was talking about incentives, I was purely thinking of the offer discount I think. But you have to pair those absolutely with the information like Chad is talking about, because you don’t want to be just bombarding with– that’s like one of the biggest failures. People will just bombard with discount after discount. Steve: Yeah. That is what I was getting at. What is kind of the email ordering and the mix look like? Do you do content offer, content content offer? Do you kind of get what I am asking? Austin: Sure. And that’s going to depend a little bit on the brand, and how much information they’ve got or what type of a job they’ve done in creating quality content, but typically about 50/50 ratio is what I like to go with, what’s worked best for us. 50 between high quality content and then clear offers to make a purchase. Steve: And how far out are these sequences before you kind of just stop trying to get that initial sale? Austin: If you are in an ideal world it would never stop, but realistically 60 days is a good– 30 to 60 days is a good timeline. Maybe 90 days if you are more sophisticated. Chad: But over time you can keep adding to it. Chad: Because they are all automated. Steve: I’m asking you these questions because we do– that’s what we’ve been doing. We’ve just been kind of adding onto the sequence, and I was just curious what you guys were going to say. Austin: Now you just keep– yeah, you just keep adding. Just start with at least 30 days. If you are listening and you don’t have this setup, start with at least 30 days because that’s going to give you the ability to have like four emails in 30 days. It’s a great place to start. Steve: So let’s talk about implementation very briefly. So you guys mentioned you use a tool called Clavier. Steve: How do you use that tool to setup these complicated funnels? Is the functionality already built in there? Is it straightforward? Austin: Yeah. It’s fairly straight forward. I think one of the advantages of using a program like Clavier for an eCommerce store is that the integration allows you to pull information from not only just newsletter subscribers, but from customers who you’ve ever had in your database which is awesome because then you pull it over. All the information you’ve got in your store is then easily sortable in Clavier. So then you can run basically segments and sort based on behaviors. You can create a VIP category where you filter people who purchase six times. Those are going to be very different customers than people who purchase one time and never come back. Steve: Sure. Does that imply then that you kind of import in your shopping cart database over to their platform? Austin: Yeah. It automatically pulls everything over there which makes it so, so easy. So once the integration happens it will be talking back and forth using the API and it will be– yeah, you’ll be able to see almost in real time. When people make a purchase they’ll be updated in Clavier and then all your funnels can be triggered from within that. Steve: This is starting to sound like a Clavier advertisement here. It sounds really cool. Steve: Just for the record these guys are not affiliated. Austin: I know, well the thing is [crosstalk]. You don’t have to use Clavier; it just makes it a lot easier. So I’ve used so many different platforms; MailChimp, AWeber, Infusionsoft, Get Response– literally like almost every single one of them. And the difference is that nobody– the stuff we talk about doing like segmenting and figuring out the difference between domestic and international orders, it’s not possible to do with a lot of the other programs. And that’s why I think we are just scratching the surface on what we can do is because now we are able to understand where people are coming from, what their intention is on a website and follow up with them accordingly. And that’s why we like using it because it allows you to do all that stuff. I think Bronto does something similar as well but yeah, we just had a lot of success with it. Chad: And it’s gotten to the point where Austin now requires me on the front end to require somebody to switch to Clavier on. And we have no financial incentive, that’s how good it has become. Chad: We don’t work with anybody who is not using Clavier and if they aren’t they have to switch to it. And afterwards they always ask, “Well can we still keep our old one,” and we said, “Yeah, keep it.” And then next thing you know they are like, “Let’s forget it. Let’s just move everything to Clavier.” And like I said there is no financial incentive for us on this. Steve: I was just about to make that comment. You guys are not affiliated with Clavier in any way. Austin: We do have a discount for all of our clients. People that sign up with us they get a discount for using it, but we don’t have a financial relationship with them. And then it honestly comes down to just us– we want people to use what’s best out there, and be impartial in that sense. We’ll switch if there is something better, but for the time being this is what we found and it’s worked to accomplish our goals in ways that things we’ve wanted to do for a long time are now possible are using the software. Steve: Yeah, awesome. Hey you guys we’ve been talking for quite a while. Steve: So just for the listeners out there, Chad and Austin– this is what they do and they do it well. So if you’ve got an eCommerce store that’s kind of struggling to hit the next level and you are not really taking advantage of email marketing, I’ve learned a lot from these guys. And so Austin, Chad where can they find you if they want to reach out? Austin: Well you can go to our website Ecommerceinfluence.com, that’s a great place to start. It’s got all the information about our podcast; you can listen to it there. And also Chad has got– if you qualify, like if you are listening and you are really like above, typically like a $500,000 run rate we also create behavioral marketing, triggered email like audits to give you an idea of where your revenue could come from. And like if you are already sending emails or not sending emails, what that sort of thing would look like and that’s over to Ecommerceinfluence.com/apply. Chad: Yeah. Basically that’s an audit plus a blueprint. So at the end of the day, like you said if you quality we’ll be able to do the duty audit or create a blueprint for you and what you need to do, and then you can either implement it yourself or we can do it for you. Steve: Sounds good guys. Well thanks a lot for coming on this show men. Austin: Thanks Steve. Hopefully– it was good. We will hopefully answer some questions about your own business which is kind of– we use our podcasts to get some insight about our own business. It’s a great little thing to do. Steve: Cool men. Well take care. Steve: Hope you enjoyed that episode. Austin and Chad are a few of my go to guys when it comes to using email to effectively boost sales for an eCommerce store. And hopefully you all learned something today. Now if you aren’t sending email to your customers then you are definitely leaving a lot of money on the table. For more information about this episode go to Mywifequitherjob.com/episode65 and if you enjoyed this episode, please go to iTunes and leave me a review. Because when you write me a review, it not only makes me feel proud but it helps keep my podcast up in the ranks so other people can use this information, find the show more easily and get awesome business advice from my guests. It’s also the best way to support the show. And please tell your friends because the greatest complement that you can give me is to provide a referral to someone else, either in person or to share it on the web. Steve, really enjoyed this podcast. I’m glad you brought up the issue of “training customers” to expect discounts and how to address that, and I found the whole session opened my eyes to the possibilities targeted, segmented email marketing can generate. Noticed there was no mention of combining this type of marketing with old-fashioned snail mail. Because almost everything sent in the mail these days is junk or bills, could this not be a complementary secret weapon if used judiciously (e.g. thank you cards)? It’s been a long time and I’m glad you’re still a reader. I’ve never thought of using snail mail actually. If you know of anyone who uses it, I’d love to have them on. Hey Steve, love this episode! What’s the email marketing tool that Chad and Austin uses? It’s spelt as Clavier in the transcript but I can’t find it. Could you please confirm the email marketing tool referred here, “Clavier.” I’m unable to find it. It’s Klaviyo. Tell them I sent you! I love your podcast. This episode was super relevant to me since I use Klaviyo. I use all their features and it works great. Austin and Chad, have given me new ideas on how use it more effectively. Thanks Guys. My question is – Is there a good hands on workshop for Klaviyo. Where I can learn the more complex aspects of Klaviyo? Or is there a service that can coach me ?